The Thrift World: Music Freebie! Impress your friends with your refined taste in classical music when you add these tracks to you iPod. 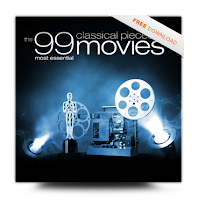 Right now at http://www.x5music.com/specialoffers, they are offering The 99 Most Essential Classical Pieces in Movies as a FREE download. You just put in your email address, they send you a link which gives the free download. I can attest that it works and it's not a virus or anything like that. But, I would recommend using a secondary email address or just unsubscribe after you download. In general, it is a good idea to keep a second email that can be used to sign up for things on the web, so one email can get clogged and your real email stays nice and clean without spam!